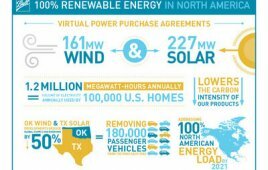 Cummins announced that it has entered into a Virtual Power Purchase Agreement (VPPA) with EDP Renewables North America (EDPR NA) to expand a wind farm in Northern Indiana. The agreement is another step for Cummins as it works ambitiously to reduce greenhouse gas (GHG) emissions. Cummins’ newly entered agreement will add 75 MW to the existing 600-MW capacity at the Meadow Lake Wind Farm complex. This will be enough to power approximately 20,000 average Indiana homes. The expansion will add 75 MW, enough to power approximately 20,000 average Indiana homes, to the existing 600-MW capacity at the Meadow Lake Wind Farm complex. “At Cummins, our strategy is to provide clean, fuel efficient and dependable power for our customers with the least environmental impact possible,” said Brian Mormino, Executive Director of Worldwide Environmental Strategy and Compliance at Cummins. Once fully operational, the wind farm expansion will generate renewable electricity equivalent to the amount Cummins uses at its Indiana facilities. In a VPPA, the wind farm owner sells the power into the broad power markets that feed the regional electric grid. The agreement with Cummins provides certainty that enables the project to move forward as it guarantees a fixed price for that electricity. Cummins benefits as the VPPA provides a hedge against rising energy prices and the company will receive the renewable energy certificates to ensure greenhouse gas reductions. Cummins has a history as an environmental leader. It has been actively pursuing energy efficiency and greenhouse gas reduction in its facilities since 2006 when it set its first GHG reduction goal. The company has a total of 11 solar arrays including projects installed in Jamestown, New York and in Beijing, China. Cummins’ Environmental Sustainability Plan includes a 2020 energy intensity reduction goal of 32% from the base year of 2010. Also part of the 2020 goal was a commitment to increase renewable energy, and this VPPA delivers on that promise. Cummins has committed to using science-based target methodology as it develops its next GHG reduction goal. In 2016, Cummins received the Award of Excellence from the Clean Energy Ministerial in the Energy Management Leadership Awards. The Company has been listed on the Dow Jones Sustainability Index since 2006 and has a reputation in the industry for its environmental leadership by reducing emissions from commercial vehicles and other products with its technological advances.